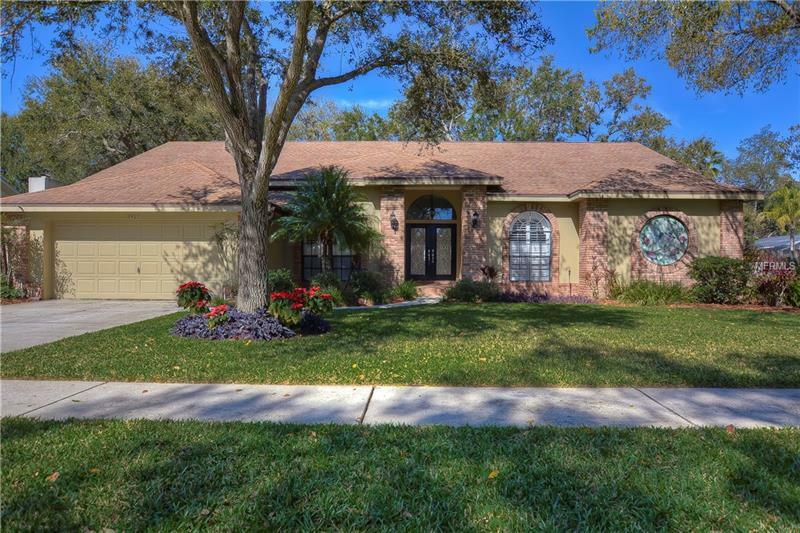 This STUNNINGLY remodeled family home is located in the heart of Valrico! Zoned for GREAT schools! Lovely brick accented exterior welcomes you into the double leaded and beveled glass doors. Inside awaits a bright open formal living room space flooded with natural light through oversized sliders and transom window! The entire interior of the home was repainted and welcomes all of your dÃ©cor! Formal dining room boasts wainscoting and plantation shutters! Wait until you see this gourmet kitchen! Remodeled in 2012, this marvelous space features granite counters, rich cabinets topped with crown and featuring pull-out drawers, upgraded lighting, travertine flooring and plenty of bar seating! A bright nook area is adjacent to the kitchen with pretty beadboard molding! Open family room is grand with vaulted ceiling, more beadboard molding and pocket sliding glass doors overlooking to the lanai! Master suite was remodeled in 2016 with gorgeous flooring and a spa like en-suite with desirable stand-alone soaking tub, walk-in shower and elegant cabinetry with tons of storage space, make-up vanity and his & hers sinks! Second bedroom is close to the master, making a great home office or even a nursery! Two more bedrooms are privately tucked away behind the kitchen and two more full baths have also been beautifully remodeled! Seriously, this home is turnkey! Outside is a stunning pavered lanai with tons of covered seating & a huge swimming pool! Fully fenced yard on this oversized 0.34-acre lot! This home is a winner!